As far as I’m concerned, there should have been, at the very least, fireworks and a parade. It deserved live news coverage, with dramatic theme music and a catchy media title, like “Farm Watch Frenzy”. 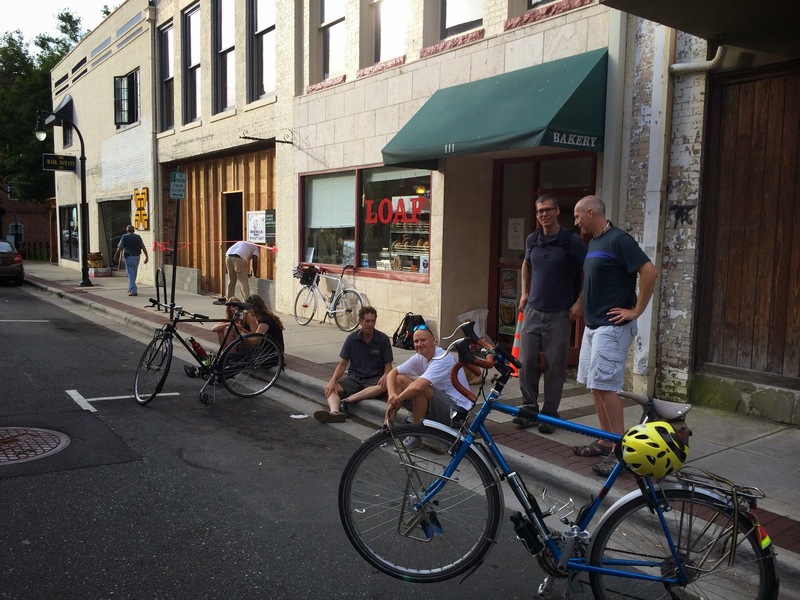 Last week, the Durham farmer’s market (Durham Central market, 501 Foster St) had their inaugural 2015 Wednesday afternoon market. It’s Christmas for gluttons and food folk. 1. )It starts at a reasonable hour. I am neither chicken nor farmer, so to be awake and functioning in the early AM is punishment to me, and anyone unlucky enough to be around me. 2. )It’s smaller and quieter. No giant crowds, so there’s room to move, and time to speak with vendors for advice and instruction. 3. )The mid-week market gives the farmer another day to present and sell products. This year the DFM is accepting SNAP (Supplemental Nutrition Assistance Program). In partnership with the Rural Advancement Foundation International, the market will match customer’s benefit up to $10, to help stretch the allowance. To learn more, or donate, go to the farmer’s market website (http://www.durhamfarmersmarket.com), or RAFI’s website (http://rafiusa.org/). So, back to my excellent adventure. 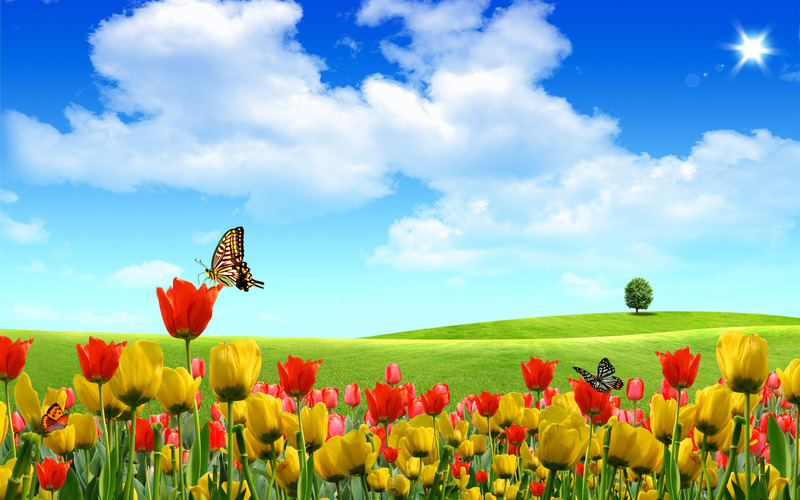 If the weather reflected the wondrous nature of the day, it would have been classic Disney, chockfull of cartoon bluebirds and bunnies, with a cerulean sky that literally sparkled like diamonds. Instead it was gloomy, rainy, and cold. 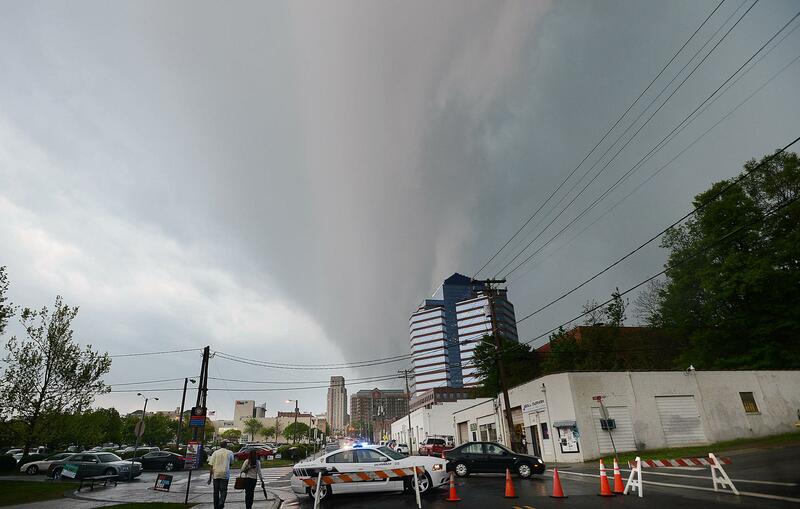 But it was farmer’s market Wednesday, so unless I was forced to literally dodge tornados, I didn’t mind. 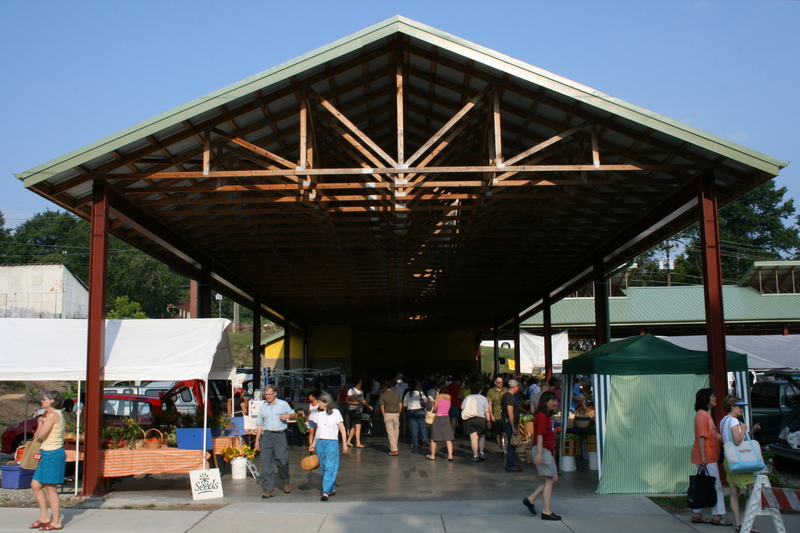 The market starts at precisely 3:30PM, with the ringing of what looks like a cowbell for Babe, the big blue ox. Before that you can window-shop, and make a battle plan. I was looking for baby carrots, some greens, and for my herb garden, a chive plant. I wandered around and spoke with some of the vendors. I asked a really hunky farmer boy about green garlic, which I’ve never used before (really; it was all about the garlic, I swear). I tasted some pea shoots and talked to their producer. Then I spoke to one of my favorite vendors; Ben Bergmann, of Fickle Creek Farm (4122 Buckhorn Rd, Efland). Fickle Creek, which is also a B&B, used to make the best hot dogs I’ve ever eaten. He had another item though, that caught my eye and set my imagination racing—pork belly. 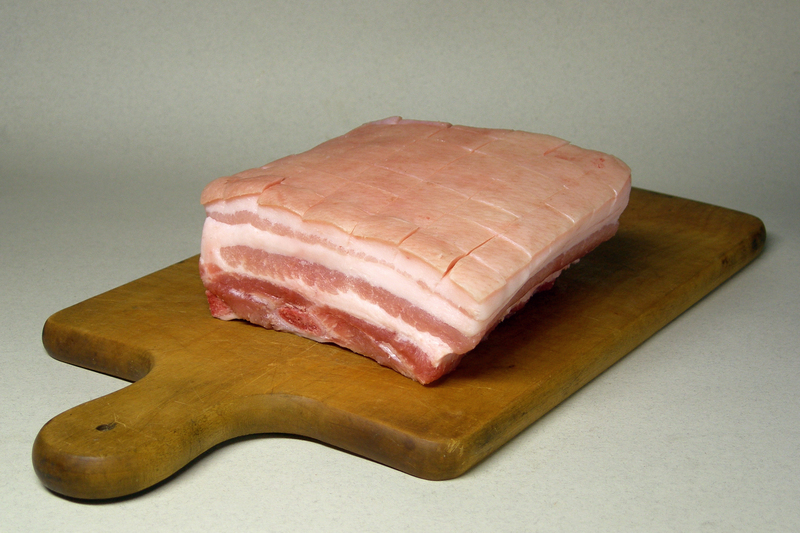 Pork belly is the cut used to make bacon, but left unprocessed and unsmoked. Belly is normally pretty hard to find, but has been showing up in restaurants and occasionally on the hot bar at Whole Foods. It’s rich, unctuous, and delicious. When I cook it, I will write all about it, and share the experience. Finally, the bell rang; I slung my canvas market bag over my shoulder and got to work. From Two Chicks Farm, a jar of pickled beets. They’re beautiful, bright, and acidic. From another farm I picked up the chive plant and a ripe, pink tomato. Tomato sandwiches on the baguette I bought from Scratch are in my future. I also got one of the last bunches of winter baby carrots. If it’s not market day, visit Sratch’s brick & mortar. Using intense self-control, I picked just one piece of cheese from the Chapel Hill Creamery (615 Chapel Hill Creamery Rd, Chapel Hill). It was Hickory Grove which will soon be utilized on patty melts. For Wednesday night’s supper I treated myself to an egg sandwich (with a side of pickled beets). Split a piece of baguette, and spread mayonnaise on one side. Cover the other side with half an avocado, mashed and mixed with salt, pepper, and lemon juice. Scramble 2 eggs, leaving them very moist. Spoon onto avocado. Put a handful of pea shoots on top of the eggs, close the sandwich, and enjoy. I picked ingredients for a few meals, but not so much that it would spoil before we ate it. I was dancing right on that line, though.